Engrossing experience with fresh game play mechanics. Nemesis system is awesome. Little touches make playing even more fun. Middle-earth: Shadow of Mordor is an open world action RPG developed by Monolith Productions, and set in the land of Mordor during the tumultuous time between the events that took place in the Hobbit and the Lord of the Rings. It features Talion, a Ranger who has fused with a Wraith, and together they seek vengeance for their past lives. It opens up with Talion crying, calling out the names of his wife and son, and seeing their bodies as he recalls the Uruks attacking his home and killing them. His mind flashes back to better times when he sees his son’s broken sword and how he used to train with him, teaching him all the skills he knew as a Ranger. It’s the same when he sees his wife’s body and he reminisces about how he used to sneak up on her to surprise her with a kiss or the discussions they had about leaving Mordor. 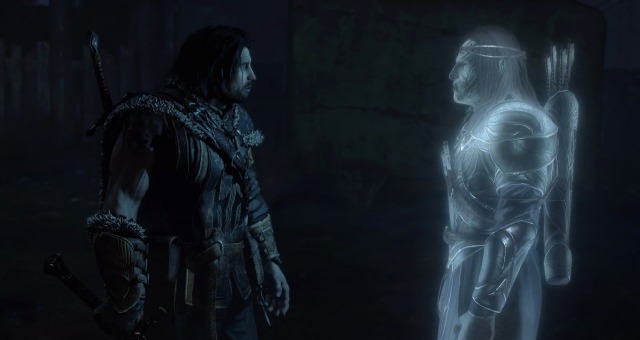 Talion wonders how he’s still alive when he recalls that he was killed by the Uruks right alongside his family as part of a ritual to bring a specific wraith back into the world. He learns that the wraith actually joined with him, and it’s responsible for him still being alive. Unlike Talion, the Wraith can’t recall his true identity or past but is filled with vengeance and a belief that his story is similar to Talion’s. One thing they do know for certain is that they want to track down the Black Numenoreans responsible for slaughtering Talion’s family and performing the ritual, and with their combined might they just might be able to do so. However, the key to becoming stronger is to uncover the truth about the wraith, so who is he and why would he be so important to Sauron’s forces and the search for the One Ring? I’ve stated on countless occasions that I’m a LOTR addict, and I was waiting for this game for over a year, as my many posts on here will attest. Even though my excitement for this game was off the charts that wouldn’t necessarily mean that the game would actually be good so I had my hopes up high but with a healthy skepticism. However, after completing it my sentiments mirror Bilbo when he was heading to the Undying Lands and wished he could hold the Ring one more time. So yes, Middle-earth: Shadow of Mordor, is now precious to me. It wasn’t just the story but the fascinating and unique gameplay mechanics that made it so difficult for me to stop playing, and to use a cliché, it was exemplary of a next-gen title and what one should expect. The gameplay tutorial actually starts during Talion’s flashbacks of his family as all the sequences described above are fully interactive. You have 3 weapons: a sword, a broken sword used as a dagger, and a wraith bow with a limited number of arrows. The sword is simple to use with only one button to attack but you can also counter opponents’ attacks or grab and throw. This is what you practice with Dirhael, Talion’s son. Despite there only being one button to attack, the animations are very smooth and you’ll usually have to use a combination of counters and dodges in fights due to the number of enemies. The dagger is used exclusively in stealth mode, which you activate by holding down the right trigger while moving. And the first stealth mission you get is before you have this broken sword, and it’s to actually sneak up on your wife to give her a kiss. I really enjoyed this touch as it made the initial events a lot more engrossing and made me feel invested in them. 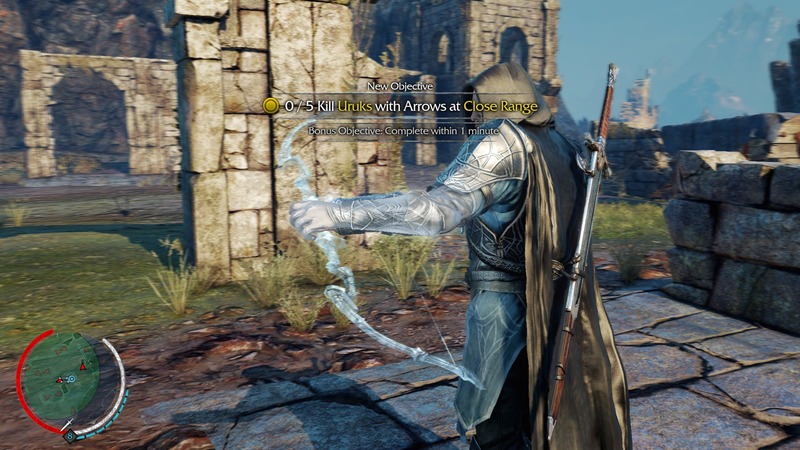 And the bow isn’t received until after Talion is fused with the wraith, and it only appears when you aim with the left trigger, which also slows down time for a brief moment based on the amount of focus you have. So the controls start off very simple, and it’s an open world experience from the beginning so once these flashback/tutorial sequences conclude you can go anywhere on the map. I did this and promptly ran into about 30 Uruks and I just ended up making them stronger due to the Nemesis system. (So I would advise you at least complete the first couple of campaign missions to get some experience with the controls and also level up). And the Nemesis system is exactly as it sounds, and one of those truly unique gameplay mechanics that puts Shadow of Mordor in a class by itself. Mordor is crawling with Uruks, and there are different types of them but there are also different levels based on their social structure. So there are regular Uruks, captains and then warlords, which are the strongest. They are constantly in power struggles with each other regardless of your involvement, and if you advance the time you’ll see the conclusion to these struggles automatically through a screen called the Army of Sauron. So since they respect strength and victories, the way for an Uruk to rise in the ranks the fastest is by killing you because he gains a certain notoriety from that and instantly becomes a captain. And since you can’t die you’ll just reappear at a Forge Tower connected to the wraith’s past. So if/when you encounter this Uruk again he will not only remember the last time fighting you but will taunt you as well based on how that battle occurred. So you’ll know you’re fighting a captain (or warlord) based on the pre-fight taunt animation or you can identify them from a distance by entering the wraith world by pressing the left bumper. (It’s similar to the world one sees when putting on the One Ring). So your toughest enemies can be completely random Uruks who become more powerful through these battles or fighting and killing you. Even if you damage one in a battle but he happens to escape, he’ll bear the scars of that battle and will mention them. And another one of the beautiful aspects of this system is if an Uruk kills you on many occasions he’ll just be even tougher to beat and will be labeled your nemesis. So I ended up having a strong disdain for my first nemesis not because the story said I have to beat him but because this random Uruk kept killing me, becoming stronger, and then taunting me about it. So the Nemesis system worked on every level because I despised him as much as he despised me. And every Uruk has their own set of strengths and weaknesses so learning that can be critical before a fight. Now, this system could only be so engrossing if the combat is fun, so thankfully the combat is thrilling, and the new mechanics only get better as Talion and the wraith’s power grows. There are many ways to damage and kill enemies including environmental hazards such as fire that can be used to your advantage. There are also beasts in Mordor that are hostile to everything, including Uruks, so you can unleash any of these beasts and watch them reduce the Uruks’ ranks when you’re trying to infiltrate a stronghold. You haven’t lived until you’ve used a wraith arrow to detonate a fire that Uruks are sitting around at night talking, and then destroying all the cages so the beasts can take out a few more. It’s very exhilarating. However you can’t just run into any stronghold haphazardly because you will be overwhelmed (or a mission has certain objectives) and so it’s a good thing that the stealth mechanic is solid and just as fun. You can actually run while in stealth so you’ll always feel as if Talion has extraordinary powers due to the wraith. And Shadow of Mordor is an action-RPG so you earn XP through a variety of tasks, and there’s also Mirian that you earn by finding collectibles or performing specific side missions. The skills tree is separated into 2 parts, one for Talion and one for the Wraith. So you can assign your skill points to unlock abilities for either one. There are levels to the skills tree so even if you have skill points available from leveling up you won’t be able to access the skills on the next level of the tree unless you have enough Power points, which you acquire from completing specific side missions related to the ranks of Sauron’s Army. And the Mirian you collect is used to improve specific attributes such as increasing Talion’s overall health, the number of arrows he has or the number of runes that can be attached to any of his weapons. So the RPG elements can get deep although you can pretty much unlock everything so you can’t truly customize Talion except through the runes that you find to enhance your weapons. 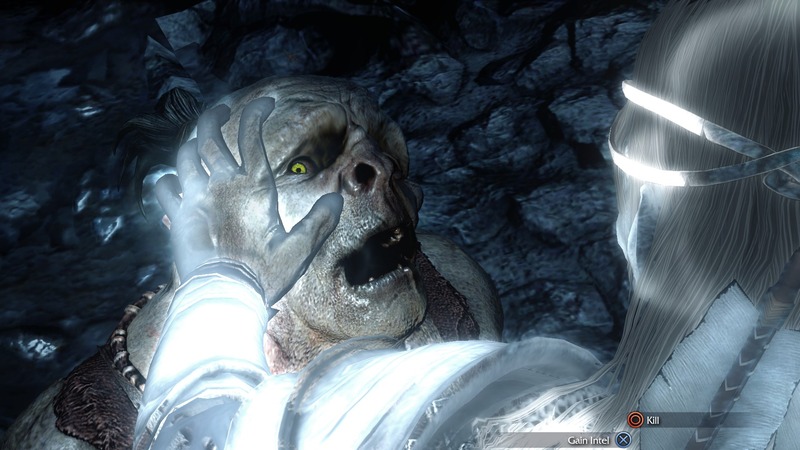 But the new skills that you eventually unlock are fresh and vary from Wraith Flash attacks, which is a form of teleportation, to being able to brand Uruks, which puts them under your control to activate them whenever you want. All of this gives you an almost unrivaled amount of ways to complete a mission or attack a stronghold as you can make uruks fight each other, beasts fight everyone or use your formidable skills and combos to do the most damage or turn Uruks to your side in the middle of fighting. You won’t get branding until more than halfway through the main missions but it’s definitely worth it and comes right on time to keep the game play fresh. The open world is enticing enough for you to want to fully explore it, and the hunting and survival missions give incentives to examine it a little closer. 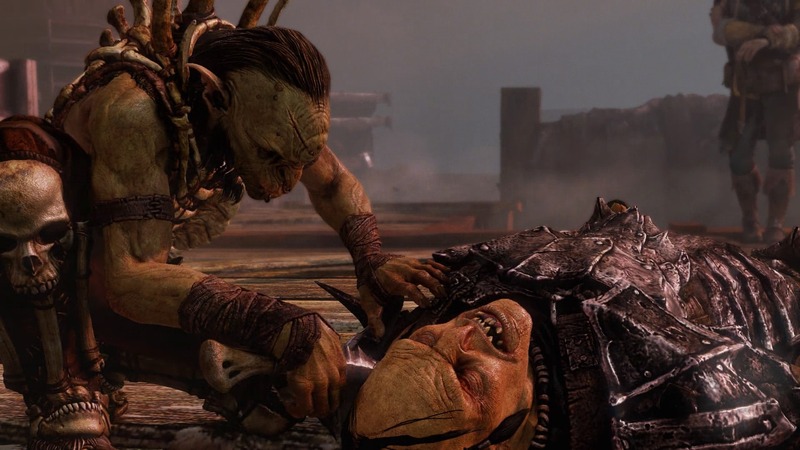 You’re not the only human in Mordor and you’ll see many slaves in the open world you can free by killing the Uruks around them, and there are even occasions and missions where they fight back with you based on the situation. However, there are only 2 maps, one of which is only available after a certain point in the game so you’ll learn the ins and outs fairly quickly. It doesn’t take long to travel by foot from one end to another but there are also mounts available to ride and you can fast travel between towers. You can climb anything in the game but you don’t take any fall damage whatsoever due to your wraith abilities. I know there were premature comparisons to Assassin’s Creed based off pictures or videos but as one who has played every single AC game except 1 or 2 of the side titles, Shadow of Mordor has way too many unique game play elements and mechanics to be compared after playing it. It is indeed its own game. One concern prior to Shadow of Mordor’s release was the way its story would treat the Tolkien mythology, and if it would remain faithful to it or deviate drastically. So I’ll say it gives the best of both worlds as you’re led deeper into the Tolkien mythology while trying to discover who is Celebrimbor, the name of the wraith, and what is his connection to the One Ring? The answers come in the form of discovering artifacts that once belonged to him, and some through the help of Gollum, who despite losing the ring to Bilbo still has an eerie connection to it. With every artifact that’s discovered Celebrimbor remembers more about his past life, and his power grows as well. The entire story isn’t just a scavenger hunt for lost memories because you will encounter various characters who will need your help or will play a crucial role in your search for the Black Numenoreans. I found the story to be rather engrossing with some memorable characters, although initially I was worried about the role that one particular Uruk, Ratbag, in advancing the story but thankfully his role wasn’t prominent throughout the entire game. And I was exciting to see the story explore elements of Tolkien Mythology that haven’t been shown in pop culture much, if at all, lately. And considering the time frame and seeing how the story is set in Mordor, it makes sense that there aren’t a ton of humans everywhere except as slaves. At one point I did wish there were more side quests thta involved humans but that sentiment didn’t occur until after I completed 100% of everything in the game. So I would attribute that to just loving the game and wishing it didn’t have to end. And that’s saying a lot because Shadow of Mordor not only satisfied my LOTR addiction but a desire for a great game in general. Middle-earth: Shadow of Mordor is an addictive game that has many unique gameplay mechanics and an engrossing story making for one of the truly great next-gen experiences. From the beginning with the flashbacks of Talion’s family being killed to the final mission, I never wanted to put my controller down because there was so much to do and enjoy, and even smaller things I haven’t mentioned in my review. The Nemesis System works as promised, and was even more enjoyable than I anticipated as I despised my nemesis, and even wanted to get revenge for the times the game shows you where other friends playing got killed. The controls and the combat options were very solid, and branding Uruks was one of the most exciting combat options. I know that this game was recently released and there will be a lot of DLC adding new features but after this foray into Tolkien mythology, I’m really looking forward to revisiting Middle-earth perhaps in a sequel, and I couldn’t be more ecstatic about that. If I could get chance I would play the dlc, but we’ll see :). Hmm I haven’t heard that about DLC’s I recall something like err..Lord of the Hunt or similar that would simply add more creatures to hunt, and this one that gives a skin of Celebrimbor and allows to fight in his little flashback war, but if they really will give mounted enemies then cool, though on the other hand it would be nice if they put it into original product, it’s not as if they would run out of things from lore to put in future games, Middle Earth and it’s elements would last for at least several games and much longer than main quest of SoM :). As for the plot up until the point I mentioned I really liked the revealed flashbacks and this one where Celebrimbor perceives the making of the One Ring from afar and when Galadriel says ‘we are betrayed’ was really climactic. As for Gollum’s involvement it was justified and explain to myself that the dreams and bits of knowledge he has which reasonably he shouldn’t be supposed to know are due to his connection to the One Ring. Even Frodo had prophetic dreams and hints of insight into things (apparently One Ring gives ‘power of understanding’ along with understanding of tongues which in turn allowed Samwise Gamgee to understand conversations of Orcs in Mordor in their language) though some of the dreams can be also explained tby the fact that he is THE CHOSEN ONE hahah. The Ring also later on opens Gollum, makes him more susceptible to the summons, so he travels towards Mordor. Sauron in Mordor is able to bend his will to lure, call and gather wicked things to him to later dominate. I also quite like the idea that while indeed Sauron retreats from Dol Guldur in Mirkwood driven by the attack of White Council, in the end it turns out that this was a deliberate move on his part, that he faked to escape and as planned all along he entered Mordor that WAS ALREADY PREPARED for him by Nazgul. It’s a shame they didn’t went that road. Apperently as the word of developpers have it, in their vision Minas Morgul wasn’t yet, as in the book, conquered by Ringwraiths, even though in-game we do not go even near the place (another wasted opportunity that would be cool look at the descriptions of Morgul Vale, 🙂 ahh that would be creepy and marvellous experience to go there) apparently it’s a move to deliberately connect to recent Hobbit movies where it shows Nazgul released from tombs (in which they never were put to begin with since they were never ‘dead’ but it’s PJ’s invention) I think I heard it in one interview. As for Nazgul’s presence in game I think it could work if done properly, after all we haven’t seen human Black Numenorean Black Captains roaming freely on maps either 🙂 only in right point when there was time for boss battle (and here my argument that I wished for more involvement of those characters since they looked cool and had interesting powers and are really menacing so why we see them only in the beginning and in time for their deaths 🙂 ), the Ringwraiths would be truly invincible since they are practically indestructible but nonetheless they could get them involved in various ways maybe even give unwinnable boss fight that would simply end with stalemate or something like it 🙂 with your opponent simply walking away (I don’t know whether you played Psi Ops the Mindgate conspiracy, nice game if not perfect, it had a boss that you fought but in the end you could not kill him and he simply escapes and is seen frequently in cutscenes, though this game was more of a shooter with stealth elements so 🙂 by the way if you did play this game what did you thought about it?). Saruman discovers that Sauron’s servants are searching the Anduin near Gladden Fields, and that Sauron therefore has learned of Isildur’s end. He is alarmed, but says nothing to the Council.” this is two years before The Hobbit takes place and consequently THIS search was the reason why Saruman consented for attack on Dol Guldur, wow cause and effect haha 🙂 so detailed history of fictional world sometimes needs much attention to fully grasp HAHAHA, Tolkien probably spoiled me giving so intricate web of story full of interconnections where even small persons and events matter 😉 in larger scheme). Now I’m interested what will the future of gaming in Middle Earth bring us, I really hope for revival of interest among developper studios and maybe FINALLY we’ll get a great open world rpg in Middle Earth some day, now it’s almost a requirement, something a la Elder Scrolls or new open world Witcher or any other good open world game of the genre. Sequel for SoM would have even bigger expectations now since it turns out that game is really good. Who knows what we’ll see I hope it will get better and better. By the way I recently read a nice article on Polygon about history of Lotr gaming hehe it had really interesting information both about some of the games and licensing issues of lore. Yes, there are so many things they could’ve covered story wise in the game. However the part about Saruman could still be a spoiler since the final Hobbit movie hasn’t been released yet so there are a lot of things about him that still aren’t know widely. So his hunt for the Ring and belief that he could bend it to his will and usurp Sauron might be alluded to in final movie. I also view other things as what the developer could reasonably include in the game and make as solid as possible. They wouldn’t have the same leeway as Ubisoft with tons of glitches in Assassin’s Creed: Unity because that’s a brand that people recognize and already have interest in. I think that having the Nazgul in this one would’ve made things more complicated in terms of game mechanics, and story wise I think the decision was to make it more accessible. Any follow up game would have to get deeper into the lore in some way and I think that’s the opportunity to get into some of the things that this game didn’t cover. So I can see an unbeatable enemy at some point since the Nemesis system already works for other characters and they can just build on the system itself. And yes, the Witcher is a game that I can’t wait to play. The open world looks incredible and can really move the genre forward if successful. And no, I haven’t played Psi Ops the Mindgate. Do you know when it was released? Ah yes the Psi Ops: the Mingate Conspiracy is a game on PC, but also Xbox, Playstation 2 and other platforms released in june 14, year 2004. I actually enjoyed this game very much, I got it several years ago and since then I played through at least two times hehe. Basic concept is that you use and implement psychic powers in gameplay but I won’t spoil it to you and exactly those powers you get are really AWESOME issue. Hey maybe you could get to know this game and made your own review of it. As I said it is like a shooter with stealth elements but the true prize are the powers that have cool applications in game for fighting and solving problems, I had lots of fun using them (even though my computer at times had problems with the game hehe,). I wish there was a sequel though, it had great potential for whole franchise sprouting from it and now sadly . As for involvement of Saruman yes I forgot that the Hobbit movies deal with White Council stuff (though I have low opinion on Desolation of Smaug, this movie wasn’t enjoyable for me, so many weird things in it and while people praised it for improved pacing I actually thought it was worse than in first movie, soem sequences rushed and overpumped with actions and then others too long and..ahh whatever :)) though I’m surprised that there is actually so little of Saruman in there, acting only as obstructive bureaucrat, film focus mostly on Gandalf and Galadriel but generally White Council in movies looked not as awesome as it should, and in some ways they appeared in Unexpected Journey to be…stupid at times for no particular reason, these are supposed to be the wisest and most powerful people in Middle Earth dammit :). Also while the theme with queen Marwen being under spell of Saruman is nice touch it is also something coming out of the blue and seems to have no greater consequences (not to mention it duplicates the Lotr movie scene, though in book it is also implies that Saruman used some sort of spells on Theoden to make him weaker and more susceptible to Grima’s will, Saruman in books has really interesting mental powers) though I suppose it is there to show oh look Lotr connection (though White Wizard could have known much about what’s going on in Mordor through palantir barring the fact that when he looked in he was soon ensnared by Sauron and forced to answer to his will). By the way Saruman also studied lore of ringmaking (though there were still some gaps in it since he would have forged his own Great Ring to challenge Dark Lord) also it is implied that he could have made his own lesser ring (he calls himself the Ringmaker and Gadnalf notices ring on his finger, and maybe that also would explain why he lost so much power in the end), oh and here is another missed opportunity there is lots of talk about Rings of Power in SoM but we actually see not a single one, it was said that outside of the 20 Great Rings (including the Sauron made, the One) there were supposedly many lesser rings, ”some mere essays in craft” but still dangerous for mortals possessing some unspecified powers, it is possible that some of them could have been scattered among people and some of them could have been among loot taken by Sauron from Eregion. Small ring as artifact of actual influence in gameplay interesting idea 🙂 hehehe, but well we only get vague hint in the outro cutscene of Talion speaking ‘time for another ring’. By the way…:) how’s witcher books :)? How far you are immersed in dark world of the the Witcher? Still short stories or full novel saga? It sounded really interesting so I had to look into it and wow it seems like a great game. It’s not easy to find. Apparently you’re not the only one disappointed there hasn’t been a follow up game and I don’t know if the copyright infringement lawsuit had everything to do with that, even though Midway won. They went bankrupt and I assume WB has the rights to that game since they brought many of its assets. Anything is possible in this day and age if enough people raise the demand for a sequel or at least a reboot/remastered version of it. I would definitely want to play that. I agree that the White Council has been easy to overlook in the movies, even in the extended editions. I think maybe the treachery of Saruman was deemed more important and a sense of chaos/desperation in the journey was played up in the original trilogy of LOTR movies. I don’t know how much of that will be addressed in the final Hobbit movie or if the focus will be on Gandalf’s heroics once again, who Saruman was always concerned with surpassing him. Once the final Hobbit movie is done maybe they can use more of the characters in future games since there won’t be any concern, if there’s any now, with spoiling any of the story or characters. The potential is definitely here in the series and I love how the game is actually called Middle-Earth: Shadow of Mordor, implying that there could be even more massive Middle-Earth games in the franchise. And yes, I’ve been reading the Witcher books. The Last Wish has been really good and the subtle changes in the character are very interesting. It’s not that Geralt is much different but his initial interaction with the world compared to in the games focused more on just hunting as opposed to an overarching story. So I think Witcher 3 will reflect that more with its open world and some of the side missions I’ve already seen. Which of the books is your favorite? Yeah a continuation of the Psi Ops would be cool especially since the first game has a err cliffhanger :), hey I have an idea maybe you could set a ‘special division’ on your site to review the older games you either missed or simply were released before you started writing here 🙂 like Gothic’s or other franchises well or less known and some timeless classics, you know those good ol’ games. As for witcher books it’s hard to say which one was absolutely favourite of mine, hmm in Sword of Truth there are several short stories that I could call favourites, from novels I’m divided between Baptism of Fire (since it really focuses on Geralt and his crew) and The Lady of the Lake (but I like Times of Contempt too) hard to decide :). Well the last Hobbit movie is coming soon so we’ll get to see the resolution of the story :). Oh and the witcher 3 issue focusng on hunting methods, that you first have to track the creature, find the signs of it’s activities, chase it, this is really magnificent and so realistic that I bet it’ll truly feel you are on the hunt :), the very core of witcher and I hope we’ll get to see familiar character or two in Novigrad (hint short stories hehehe). As for Geralt characterization in books and games well I actually feel that he was well captured in games, mainly his sarcastic nature and simple honesty, because well Geralt is really a decent guy, he may be a killer but he has moral values and does not hesitate to criticize what he sees is wrong. The open world feel will definitely give us a true experience of a wandering professional monster slayer going about job whenever he can find it :). As for Shadow of Mordor, yeah there’s definitely potential in there and I wonder how it will evolve. We must wait and watch :). So, just out of curiosity, now as you are interested in Psi Ops are you going to play it? Sorry hehehe Sword of Truth hahaha I must have been thinking about different franchise (though I actually haven’t yet read THAT book only watched the tv series haha) I of course meant Sword of Destiny hehe the tome of short stories that wasn’t officially translated, only made by fans. I enjoyed Geralt’s character in the games and I think they did nail him pretty much. It’s just the start of the book had a story angle that hasn’t been explored much in the games but that will change with the Witcher 3. As for the Witcher 3 I really am now excited since it seems that (as trailer Sword of Destiny revealed) certain character from Geralt’s past will finally appear in game 🙂 (having previously only references in previous two games), and one very close on personal level, or make that two characters hehe. Generally I’m still in awe of everything so far in Witcher 3, from trailers and materials, the game has potential to become the greatest hit ever :). ” It is therefore a foolish and perilous thing, besides being a wrong deed forbidden justly by the appointed Rulers of Arda, if the Living seek to commune with the Unbodied, though the houseless may desire it, especially the most unworthy among them. For the Unbodied, wandering in the world, are those who at the least have refused the door of life and remain in regret and self-pity. Some are filled with bitterness, grievance, and envy. Some were enslaved by the Dark Lord and do his work still, though he himself is gone. They will not speak truth or wisdom. To call on them is folly. To attempt to master them and to make them servants of one’s own will is wickedness. Such practices are of Morgoth; and the necromancers are of the host of Sauron his servant. It’s interesting that you bring that up about power and control because some of the orcs allude to this in how they say that Talion is no different from them. I know some of that was just talk but the game walks a very fine line when it comes to that but doesn’t ignore it in the story either. Again, I think the game could only cover so much story wise in one game let alone its first one so I think a good job was done in planting seeds for future storylines. If Talion/Celebrimbor can dominate an unlimited number of orcs then what question does that raise about the nature of orcs? Ahh nature of Orcs, the eternal mystery 🙂 hehe Tolkien struggled himself with the question he even made several drafts of theories on their origin and nature, as of Lotr as it was published though he agrees that they were made from pre-existing previous life form, terribly corrupted and altered to suit the purposes of Dark Lords and are ‘people’ in a sense. They are bad but Tolkien believed that saying they are irredeemable is going too far, as he also believed that there is really no Absolute Evil and only as close approach as possible with corruption of independent being (also as he noted Mouth of Sauron a mortal man, one of the Black Numenoreans, sorcerer, herald and ambassador of Mordor and Lieutenant of Barad-dur ”was more cruel than any Orc”, :)). And the in-fightings as we see are mostly done between different groups or tribes or clans of Orcs, that often also used different dialects of orc-languages (Orcs are billingual and literate too, they can write and read runes, they can count and are quite clever, skilled craftsmen). Orcs are useful slaves as Lotr says us and Sauron has them in plenty, it is also probable that some of the Orcs (possibly those already bred to service, as there are also those who were recruited from ‘independent’ communities) really have some form of loyalty towards the Dark Lord as when we see Uruk soldiers ‘disciplinating’ other Orcs at the sign of ‘rebel talk’, but also they can rebel and act on their own against him simply for their own personal purposes. Sauron can easily dominate Orcs too then who knows maybe in the end idea of using Orcs as army against him isn’t that great since he has more experience in using his mental strength to dominate minds and wills :). “Truly!” said Legolas. “That I have known since first we came down from the Emyn Muil. For the will is not behind us but before us.” He pointed away over the land of Rohan into the darkling West under the sickle moon. Great info! So Shadow of Mordor really nailed the nature of Orcs with the social structure and Talion/Celebrimbor dominating them. So they can definitely build on that. Are you planning on getting the Lord of the Hunt DLC? – Uruks are very varied in looks and behaviours, that was cool, (I remember some crazy Uruk who only gritted his teeth and said nothing at first encounter only occassionally laughing like mad 🙂 ) some of them had poisoned or flaming weapons which is even more awesome :), throwing spears. 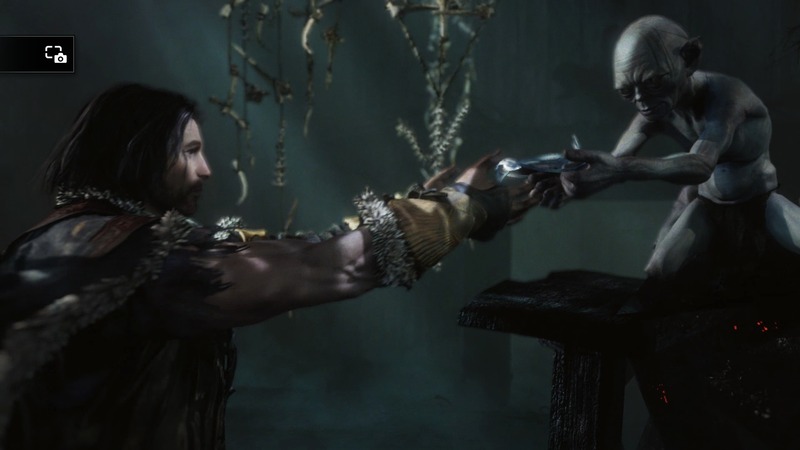 – The dynamic between Talion and Celebrimbor and Gollum (though I didn’t expected to see him so early in game but it’s an effect of disrepancy with lore so no matter). – The hunt for various scattered artifacts while not important in overal scheme of things it was enjoyable to find out things that showed a bit of lore. – Mounted combat was fun. – Presence of those Ghuls, they were interesting creatures. – The combat was very good, as were stealth mechanics. – The outcasts missions were nice, I wish though there were more of them. 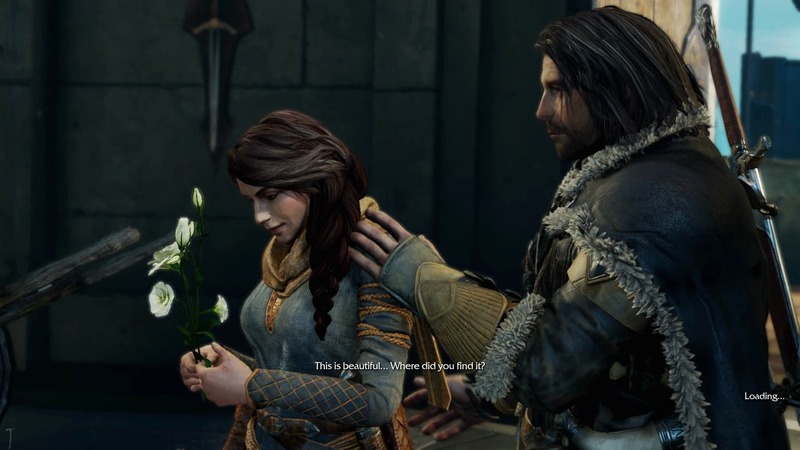 – I too liked the introduction of Talion’s family and again I think this sequence could have been a tiny bit longer, showing also maybe some companions at the Black Gate and the daily life of it’s staff and then it would make the Uruk attack even more heartrending. – Minor stuff but seeing flying fell beasts (or hell-hawks as they are also called) was fun. – Rabag was fun if a bit annoying at times and while his arch ended quickly there should have been more use of him somehow hahaha. – Some of the in-game dialogues were amusing, the voice actors were pretty good in their job, and the fact that Torvin sang Song of Durin…priceless :). – Uruks gossiping, they sit around fires and talk I sometimes liked to just sneak up on them and hear them out hahaha, really shows that the game world is dynamic since they also often talk about you. – I was a bit disappointed at the complete lack of Trolls and Wargs, sure there are those beasts Caragors and Graugs that serve as very similar substitute, but it still would give more charm if they were inserted (not to mention more enemy variety), those creatures are well..iconic for Middle Earth, andm more human enemies would be good, not only Black Numenoreans. – Character of Torvin the dwarf while interesting had too little screen time and did not look at all ”dwarvish” (hilariously he keeps talking about having a beard which he has not, not even those ”three inches long”), his character design didn’t scream to me ‘this is the real dwarf’ but that’s minor complain, the fact that we get only so few of him is major issue. – Complete lack of Nazgul not even some sighting from afar which was a shame. – I wish there was more interaction with bosses the Tower, The Hammer and Black Hand before we encounter them in the end (for example random or scripted encounters to make them more involved in game). – Generally main quest was too short for me and after a while side quests become tiny bit repetitive. -Need more caves and underground tunnels hehe :). – I wish there were mounted enemies if you can ride why not them? -The major issue the same as yours; too small areas to explore only two small zones, I hoped for at least four and larger, and after you gain entrance to Nurn (or rather small fraction of it if you look at Tolkien’s map of Mordor) there is actually little reason for returning to Udun if only for your own, some quests could have give us the reason to return other than to play on your own. Pheew that was long but I like to stick to details and with a game like this…:). In the end it is really good and if do not bothering with some lore issues (it seems that game really is closer to movie versions, but that is only Tolkien fan rant don’t mind that haha 🙂 ). 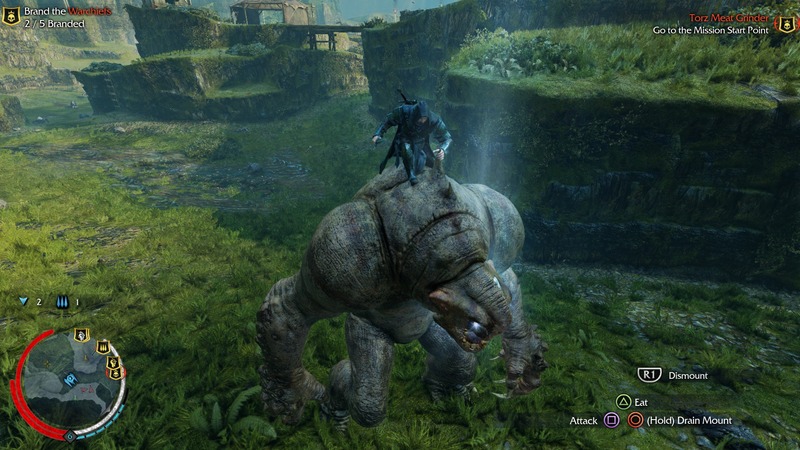 They have upcoming DLC that has enemies riding Caragors, and it adds additional features to mounted combat. Taking that into consideration I think there are most likely things that would be in a sequel to make it more massive that you’ve mentioned above. I think the story line and the limited maps would make it difficult to have the Nazgul in any form considering they would always have to be present somewhere on them. So there are many things I would want to see added such as more human interactions aside from outcast missions, and other enemies besides orcs but I can understand why they didn’t. I think the success of this game opens the door for more possibilities down the line, and it’s better to have an excellent game with everything that was promised working as opposed to having main features broken. I’m glad the Nemesis system worked so well but I was still kinda surprised that it worked so well. I would compare this to the Arkham series, which started out just in Arkham Asylum. And after that it expanded to a city, different characters, and now the upcoming one allows you to drive the batmobile. So to me this was an excellent first step that they can definitely build on to make it an even better series down the line. For the story I think they were limited to how important they could make Celebrimbor in this time period. Since the Black Numenoreans brought him back there had to be a reason, and that reason was to help with the ring. Sauron was beaten back in the Hobbit so they could only make him do so much. I looked at it similarly to Gollum believing that Celebrimbor could lead him to the ring because of his connection. But they still made it clear that only Sauron could truly command it during the flashbacks.